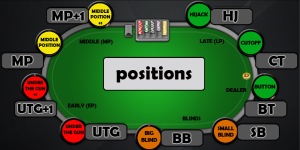 Poker Position Explained: Find Out Why Position is King! 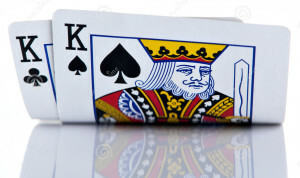 Your position after the flop has been dealt (if you are first or last to act). These two ideas are interrelated; if you play your hand from EP is it very likely you will end up playing your hand out of position (OOP) postflop. If you play your hand from the Button, you will always act last. This is considered in position (IP) play. Being IP is a very important advantage which provides you with more information than your opponent and the ability to control the pot size more effectively. The Button is the best and most profitable seat on a poker table. The Small blind is the worst seat (as you will always act first and act with the least amount of information) and the Big blind is the least profitable seat. Under the gun (UTG): this is the first seat to act when the cards have been dealt. This is a difficult seat to play as there is a large number of players to act behind. When there are more players left to act it is more likely someone will have a strong hand. For this reason, players should only play a very small number of hands from UTG. This is especially true for full ring tables. UTG+1 should be played in a similar manner. Middle position (MP): You should play conservatively from this seat (play a tight range). However, you can play slightly more hands from this seat when compared to UTG. MP+1 should also be played in a similar manner to MP. Hijack (HJ): In this seat, you can play more hands. This seat should be significantly more profitable than the earlier positions. Each position from this point forward has individual names because they play quite differently. Cutoff (CO): The cutoff is the second best seat in poker. If the Button doesn’t join the hand then you will always be last to act. We highlighted previously why acting last is extremely advantageous. You can play a wide range of hands from this position very profitably (25-30% of hands). 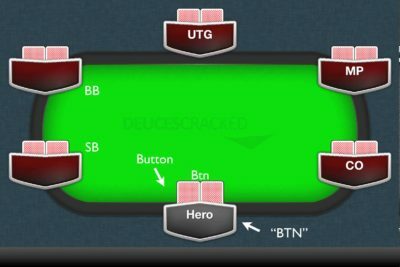 Button (BTN): The button is the most powerful seat in poker and you can play a wide range of hands from here. Oftentimes, you can play 50% or more of the starting hands from the button. Small blind (SB): The small blind is one of the two seats where you need to front up money before seeing your hand. This is a massive disadvantage and is the reason why this seat is almost always a losing seat for poker players. Big blind (BB): The big blind is the second blind seat. Forcing the BB to front up chips means that almost every player (pro or beginner) will make a loss from this seat. Each seat plays very differently from one another and as a result differentiating from each of the seats is one of the first steps to improving your game. As shown, we should almost always play pairs since they are one of the best starting hand types. But with the other hand types, it is less cut and dry. To receive your full free 6max & full ring starting hand chart, Click here for 6max and here for fullring. Check out the Common Poker Mistakes to keep learning.